Is Jet Airways going the Kingfisher way? The aviation business is cyclical world over, which makes the airlines prone to bankruptcies in every few years. The recent developments at the beleaguered Jet Airways reminds of the troubled days at KFA six years ago. The similarity between the dead Kingfisher Airlines (KFA) and the present-day Jet Airways is quite telling. The story of the fall of a large carrier like KFA was not one-off. The aviation business is cyclical world over, which makes the airlines prone to bankruptcies in every few years. The recent developments at the beleaguered Jet Airways reminds of the troubled days at KFA six years ago. KFA, which stopped flying in October 2012, is a case study for businesses on things that can possibly go wrong at a once-revered company. Though KFA never managed to report profits, the airline was able to garner substantial market share by disrupting the airline industry with its services matching that of a full-service carrier and fares comparable to low-cost carriers. A couple of months before the Kingfisher Airlines went belly up; the carrier struggled to pay salaries to its 7,000-strong employees. In May, the airline had to cancel a bunch of flights - seems to be the final straw - after pilots reported sick to protest for non-payment of salaries. When the Vijay Mallya-controlled airline was grounded, it had an outstanding debt of Rs 7,000 crore, net losses of 754 crore, and a negative networth of Rs 12,919 crore. Compare that to Jet Airways. The airline has been reportedly defaulting on employees' salaries for some time - making partial payments in some cases or not paying at all. The Naresh Goyal-controlled carrier had a gross debt of Rs 8,620 crore as on June this year, and net losses of Rs 724.94 crore in 2017/18. The airline has a negative net worth of over Rs 7,000 crore. Goyal's fight is not with the regulatory challenges; in fact, the rules allow 100 per cent FDI (foreign direct investment) in the aviation sector under automatic route. His biggest problem areas are beyond his control: elevated ATF (aviation turbine fuel) prices and depreciating rupee. With reports of crude oil prices heading north, there's clearly no relief in sight for Jet. So far, the plans to raise "survival" capital have not gone anywhere. 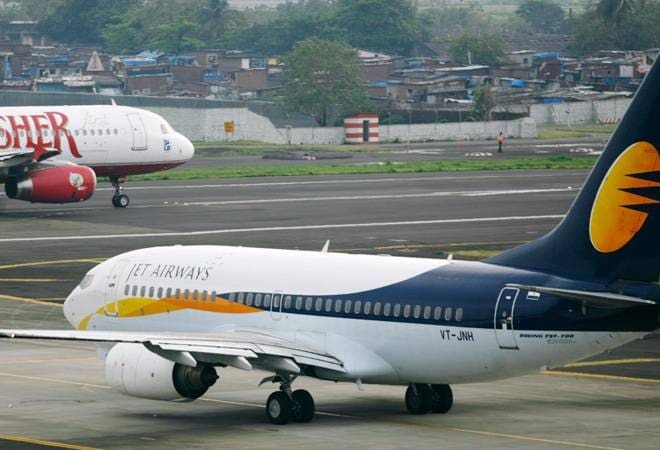 Jet is reportedly planning to monetise 50 per cent stake in the frequent-flyer programme - JetPrivelege - besides conducting sale and-lease-back of 16 wide-body aircraft - Boeing 777 and Airbus A330 - that the airline owns. Global investors Blackstone and TPG Capital have reportedly evinced interest in buying stake in JetPrivelege, which is valued at Rs 8,136 crore. The question remains that who's going to buy loyalty programme of an airline whose future is highly susceptible. It's like buying a badly-constructed apartment that's unexpected to withstand tremors. What's surprising is that none of its lenders or trade partners - lessors, MROs, OMCs - has raised concerns yet. There are some reports that suggest that one of its A330s is parked in Jordan over non-payment of engine-related lease payments. Jet has faced severe headwinds in the past, and each time, Goyal has managed to pull a rabbit out of a hat. As far as going the KFA way, it seems that Jet is either there already or about to get there soon.